If you are about to relocate to South Africa from, say, the US or the UK, remember that the seasons are opposite in the southern hemisphere. So, as summer is on the horizon in one locale, it is about to end in the other. Fortunately, all you have to do is wait a few months and summer comes around again. So even if you can’t hit the beach with your dog right now, you can start planning your upcoming sand and surf adventures. But where to go, to find all the best beaches? 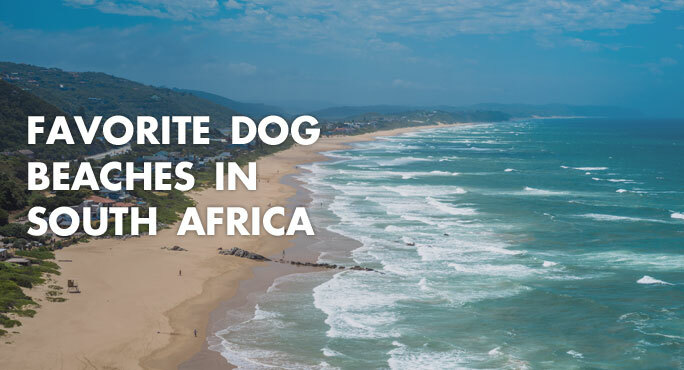 Thanks to ProMeal, a Sub-Saharan company that produces high-end canned pet foods, you can find lengthy lists of dog-friendly South African beaches here, for the Cape Town, Durban, and Port Elizabeth areas. Cape Town beaches are divided into three categories: those that allow dogs off leash, those that require leashes, and those that have seasonal time-of-day restrictions. These kick in during peak periods when there are lots of families who flock to the beach and may not be excited to share with your pooch. Port Elizabeth, on the other hand, is well-known for its strict on-leash requirement in all public places, including beaches. However, there are a few beaches that do allow dogs as long as you obey the rules. Also, remember that hydration and shady rest periods are essential when you’re playing in the sun. Dogs get hot just like people, and they are also prone to sunburn and heat stroke just like people. As the pack leader, it’s up to you to tell your pup when it’s time for a cooling break. And, speaking of breaks, be sure to pack a supply of poop bags, too. Good petiquette is always the #1 rule of the road, you’re your consideration for other beach-goers will be especially well-received. No matter what South African beach you choose to visit, with sunscreen, plenty of water, some clean-up bags, and a towel to dry off, you’ll be ready for action, interspersed with a bit of snoozing on the sand.